Have Used or Excess Cisco Catalyst 3850 Series switches you no longer need and are interested in selling? NetEquity.com buys all models of used/OOS Catalyst 3850 Series switches. We are always looking for inventory. If you have recently upgraded your switching network, or have excess inventory of Cisco 3850 switches you want to sell, connect with a buyer agent today to receive a quote! Cisco Catalyst 3850 Series switches provide a range of capabilities for converged of wired/wireless access networks. The new Cisco Unified Access Data™ Plane (UADP) Application-Specific Integrated Circuit (ASIC) powers the switch and enables uniform wired-wireless policy enforcement, application visibility, flexibility, and application optimization. This convergence is built on the resilience of the new and improved Cisco StackWise®-480 technology. Cisco Catalyst 3850 Series Switches support full IEEE 802.3at Power over Ethernet Plus (PoE+), Cisco Universal Power Over Ethernet (Cisco UPOE®), modular and field-replaceable network modules, RJ-45 and fiber-based downlink interfaces, and redundant fans and power supplies. NetEquity.com Buys and Sells Cisco Catalyst 3850 Series Switching Products . If you are looking at Buying or Selling Cisco switches, we can help! Contact us today for a quote. 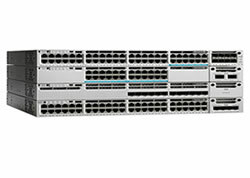 Interested in a quote to Buy New or Refurbished Cisco Catalyst 3850 Series switches? NetEquity.com offers competitive pricing discounts on both New and Refurbished Catalyst 3850 models, including the popular WS-C3850-48P and WS-C3850-12S. To request a price quote, simply contact us or complete a quote request form online to get started. NetEquity Refurbished Cisco 3850 Series Switches are professionally remanufactured to Excellent Cosmetic Condition, fully port and stack tested by Certified Engineers and reset to Factory Default settings. Our Refurbished Cisco 3850 Switches include Rack Mounting Hardware and Power Cord, and are ready to install out of the box. In addition to offering extremely competitive pricing on Refurbished Cisco Switching Products, we also offer a full 1-Year replacement warranty for End Users on all Refurbished Cisco products. We also maintain a very large standing inventory of the most popular Cisco Switch models and accessories, ensuring that we have what you need IN STOCK, with no long lead times. NetEquity.com wants to buy your used, excess or end-of-life Cisco 3850 Series switches. If you've simply outgrown your Cisco Catalyst 3850 series switches and are interested in a trade-in or upgrade, we can help. Contact us today to sell, consign or trade your unwanted Cisco 3850 Series equipment.